Learn about the practical applications of XPS analysis techniques, and get ideas about implementing XPS. Ne is a gas and is not commonly found in XPS spectra. It may be observed as implanted atoms, if a material has been subjected to ion bombardment using Ne gas instead of the more usual Ar gas. Neon was discovered through the study of liquefied air by British chemists Sir William Ramsay and Morris M. Travers. A very common element throughout the universe, only 0.0018% of the earth’s atmosphere is neon. When ionized in a glass tube, neon emits a red light. This effect accounts for neon’s largest use in advertising lighting. Neon is also used to make high voltage indicators and is combined with helium to make helium-neon lasers. Liquid neon is used as a cryogenic refrigerant. 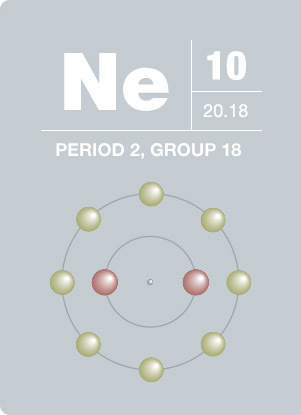 Neon is highly inert and forms no known compounds, although there is some evidence that it could form a compound with flourine. Quick Navigation Home What is XPS? Resources Instruments Elements Table Visit thermofisher.com | Subscribe | ©2013-2019 Thermo Fisher Scientific Inc. All rights reserved.